Movie Ramble: In Our Name. 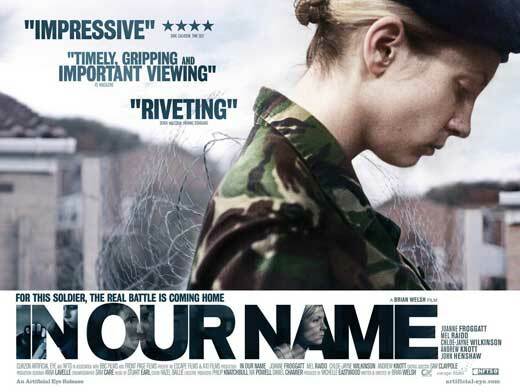 “Dedicated to the thousands of service men and women incarcerated in British prisons after returning to a civilian life” is a quote at the end credits that gives the basic premise for this well written and well-acted film In Our Name (2010). Suzy, a private in the British army, returns home from a tour of active duty in Iraq. She not only struggles to readjust to normal civilian life away from the war zone but finds it impossible to go back to having a sexual relationship with her squaddie husband Mark and to rebuild a bond with their daughter Cass. Joanne Froggatt, who won the Most Promising Newcomer at the British Independent Film Awards for her feature film debut role as Suzy, displays quite traumatically the effects of posttraumatic stress disorder, which as the story progresses we learn stems from an incident in Iraq which involves the death of a young girl about the same age as her daughter. The character refuses to acknowledge that a problem exists, one that deteriorates greatly when she discovers hidden photos of her husband posing with Iraqi corpses. Obviously war can brutalise soldiers and many will return home unable to cope. While they are still in the forces it’s the military that responsible for treatment. Once they leave and return to civilian life then it’s down to the NHS who have been accused of dumping veterans on service charities like Combat Stress. The veterans struggle to find help which in not always available. In turn this lack of support can lead to homelessness, family breakdown, prison and even suicide. It’s no wonder that UK governments have been accused of neglecting our soldiers. In America it has been estimated that just fewer than 50% of the homeless are Vietnam veterans! Can’t understand why this meaningful film has not had a wider release, It can’t possible have been for political reasons? Director Brian Welsh has certainly not presented us with an easy watch, but one that adequately justifies the movies tagline ‘the real battle is coming home’!